Sign-off of the New York metro area's flagship station of the Public Broadcasting Service (PBS) and producer of a number of the PBS network's programs. This 1984 clip is announced by Donna Drews. The Thirteen sign-off is unique in that it makes mention of several chief staff members that handled the day's programming duties. The WNET sign-off of 14 February 1987 utilizes the same video montage as this clip, but is delivered by a male announcer, presumably live. WNET Thirteen would go 24/7 in the fall of 1987. The story of Thirteen begins in May 1948 when it first telecast as WATV, New York City's first commercial independent station.  In 1958 the calls became WNTA-TV after the station was purchased by National Telefilm Associates (NTA), a distributor of motion pictures for TV who ran the NTA Film Network. But the station's ratings were still well behind those of New York's three other indies. NTA ultimately sold Channel 13 in December 1961 to Education Television for the Metropolitan Area (ETMA), a group comprised of businesspeople, cultural leaders and educators. After ten months of being dark, Channel 13 re-emerged in September 1962 as WNDT, NYC's first non-commercial education TV station. Thirteen became WNET in October 1970 when it merged with the National Education Television (NET) network, the forerunner of PBS (NET ceased operations as a network three days after the merger, allowing PBS to begin its role as America's Public TV network).